The temperatures are quickly dropping here in Springfield, MO. TLC Property Management is all about helping you feel comfortable in your apartment, wherever you live in the area, so today our blog post has some tips you can implement into your winter living habits to ensure you stay warm, comfortable, and energy-efficient this month. TLC Properties is proud to offer our residents smart apartment options, which let you, the resident, utilize technology from a tablet or smartphone to help you become more comfortable, efficient, and green. The small ways you make use of these features every day add up to save a lot in terms of energy and cost. For example, dim your lights, adjust your temperature, and turn off music or other appliances with ease, whether you’ve forgotten as you’ve left the apartment or you’re trying to conserve energy and relax at home. Be smart about your home setup. We also have a few hacks to help you warm up your apartment without bothering too much with the thermostat: first, know that humid air feels warmer than dry air. So invest in a humidifier and keep it running throughout the day to turn up the temperature. (Houseplants also are great for adding humidity to your room.) And remember that hot air rises, so turn your ceiling fan on the lowest setting going the opposite direction it normally does to push that warm air down for you to enjoy. Open your blinds to let the sunlight naturally aid in warming up your home. It’s always colder near windows and doorways because that’s where the cold air is most concentrated. Keep the colder air out by switching out thin curtains for heavier wool or fleece drapes during the winter. And when it comes to the air escaping through the doorway, do as Mental Floss suggests and cut up a pool noodle, wrap it in fabric, and slide it under your door. 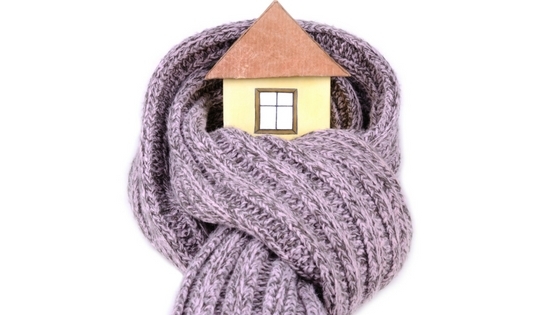 What are your best ideas for warming up and saving energy during the colder weather? Let us know by leaving a comment! Thanks for reading. We hope these ideas help this season!